The Norwegian National League is the place to celebrate Norwegian American traditions and connect with Scandinavian events in the Chicagoland area. We are the “umbrella” organization for many of the area’s Norwegian-American organizations and sponsor scholarships and three events during the year (Syttende Mai banquet and parade, a Leif Erikson celebration, and Christmas Around the World. Check our calendars for upcoming member & special events. Always check the calendar of member events and our calendar of a broader range of Scandinavian events and activities, but we thought we'd a Sons of Norway, Elvesund Lodge special event and the upcoming Syttende Mai events. Everyone is welcome! Join the lodge and help them celebrate 35 years with a heritage dinner featuring lapskaus (Norwegian stew), home-made red cabbage, agurksalat, and other delights, all for $15.00. The days entertainment is composer/performer Michael Benshish. Along with his other performances, Michael accompanies Normennes Singing Society, and The Grieg Ladies. You many have heard Michael play at Syttende Mai and Minnekirken concerts. Michael plays a variety of genre with something for everyone to enjoy, even Norwegian favorites. Call Mary Vann at 708-579-9056 for reservations. The Constitution of Norway was signed at Eidsvoll, Norway, on May 17, 1814, and declared Norway to be an independent kingdom in an attempt to avoid being ceded to Sweden after Denmark–Norway's devastating defeat in the Napoleonic Wars. This time of year is special to the Norwegian National League, its members, and all of Norwegian heritage in the Chicago area. Each year there are special events. We highlight some here with links to special pages with more details. FLY YOUR NORWEGIAN FLAG, WEAR YOUR BUNAD, BRING YOUR FAMILY AND FRIENDS TO ALL THE FUN EVENTS! Guest of Honor: Kaare Aas, Norwegian Ambassador to the U.S.
During the ceremonies after the parade, the Norwegian National League awards Scholarships to deserving students (learn more on our Scholarship page). SUPPORT THE NORWEGIAN NATIONAL LEAGUE! It's now even easier with the ability to use your Paypal account or popular credit cards. The details are on our "About Us" page. 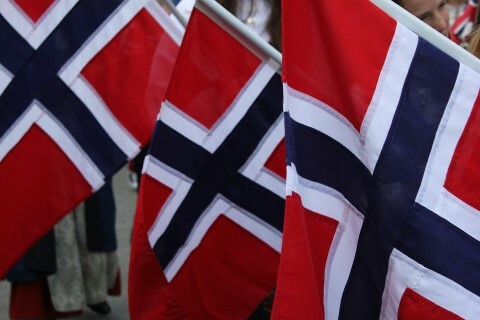 or would like to join us in our celebration of all things Norwegian, please contact us by email.